Scrap the Pay Cap – Start the fight now! Act now to break the pay freeze. Who would have thought that the issue of lifting the public sector pay cap would become such a divisive one for the government? Gove, Johnson, Greening and Hunt are leading the rebellion on lifting the cap.Of course their new found empathy for all things public didn’t stop them voting through the Queen’s speech last week which included keeping the 1% cap. Seeing nurses, doctors and fire-fighters heroically responding to the Grenfell Tower atrocity has only heightened the sense of injustice that lay at the heart of the government’s pay policy. Teacher’s pay fell by £3 an hour according to a new report by the Office of Manpower Economics. In the Further Education sector FE lecturers’ pay have suffered a staggering real terms cut in pay of 21.5% since 2009. This equates to a drop in pay of £7,850 for those on top of the scale. Jeremy Corbyn’s election campaign made pay a central issue and was undoubtedly one of the issues that proved so popular. Old Tory Grandees are rushing to the television and radio stations to try and get May and Hammond to hold the line by regurgitating the tired old arguments that pay rises put jobs growth in jeopardy. It was an argument that too often was accepted by those within the leadership of the trade union movement. This argument no longer holds sway thanks to Corbyn and McDonnells’ costed manifesto that gave concrete facts and arguments to the millions who were desperate for a decent living wage. They did so by making it clear there is plenty of money for decent wages through raising the taxes of the wealthiest. Clearly the Tories and employers are on the ropes over pay. The firefighters 2% pay offer should signal the opening of a tidal wave of claims that breaks the pay freeze. Whilst there is so much public support and the Tories are in such a mess the Trade Union movement must act now to secure a decent living wage for public sector workers. A lobby of parliament and ‘scrap the pay cap’ rallies around the country would be a start. But coordinated strike action across the sector must be a centre of our campaign to stop the pay freeze. Of course there are real concerns about the ability of trade unions to be able to deliver a vote for action that reaches the new government threshold of 50%. But as the general election has shown anything is possible is approached in the right way. If unions invited Corbyn and McDonnell to speak alongside the General Secretaries to speak at rallies in major cities to help get the vote out out when a ballot is called, then the 50% threshold would easily be reached, even in the bigger unions. The UCU Further Education sector conference voted overwhelmingly to ballot its members over pay. There were arguments against on the basis that the union couldn’t secure a 50% turnout even if we could many members would not come out. Delegates were not swayed by this defeatist argument. UCU is now preparing its members to be balloted for a programme of strike action. To succeed in encouraging members to participate the union must put all its resources behind getting the vote out. But we need more to follow suit. Get your union branch to meet as soon as possible and pass this motion (see below) calling upon the leaderships of the movement to move swiftly to finish off the public sector Pay cap and with it this Tory government. Millions of public sector workers have faced wage freezes over the last seven years meaning a real terms pay cut of 10%. The TUC calculates that individuals are on average £1,232 p.a. worse off than in 2008. In the NHS it’s even worse, with the majority of staff seeing a 17% real terms pay cut. Theresa May just found £1 billion for to buy the votes of DUP MPs. Further Education sector FE lecturers’ pay have suffered real terms cut in pay of 21.5% since 2009. This equates to a drop in pay of £7,850 for those on top of the scale. 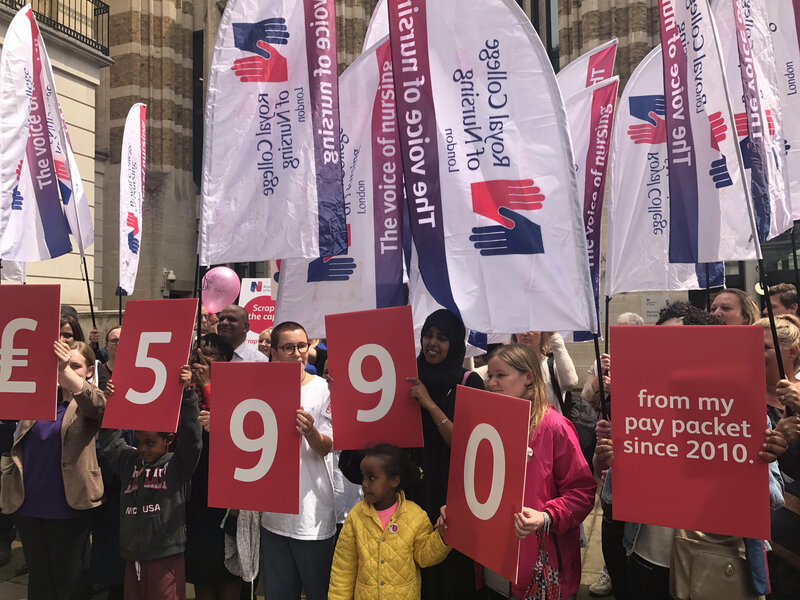 Call on our union to push for a national dispute over pay – calling for an above inflation pay rise. To ballot for strikes and if necessary to call strike action. Call on our union to invite Jeremy Corbyn and John McDonnell to speak at pay rallies to help get the vote out when ballots are called.